This software is only for Windows XP / 7 / 8 / 10, please view on a non-mobile device for downloading. 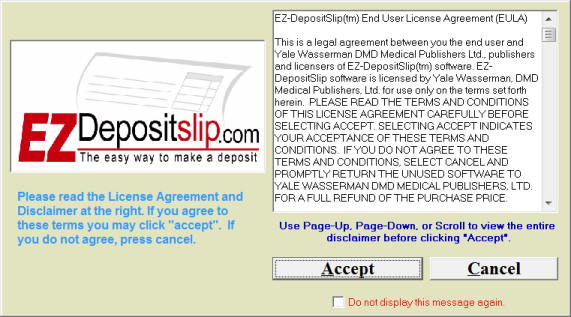 Thank you for trying EZ-DepositSlip. You are just a few minutes away from never hand writing another deposit slip. 1. Select the blue “DOWNLOAD DEMO” link above. Chrome will start downloading the file ezdepositslip_demo.exe and display a status message in the lower left corner of your browser as shown below. Select “Open when done” to start the InstallAware wizard. If you cant locate the download file press Ctrl-J on your keyboard to display all downloads. 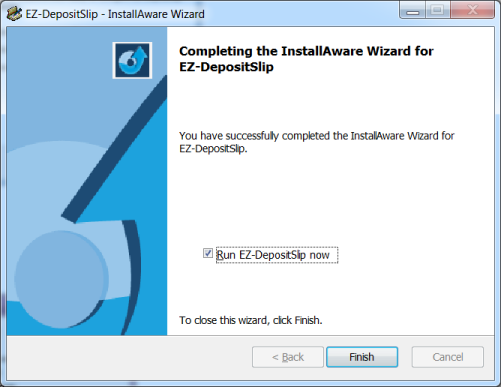 Double click the file ezdepositslip_demo.exe to launch the InstallAware wizard. Go to Step 2 below. 1. Select the blue “DOWNLOAD DEMO” link above. 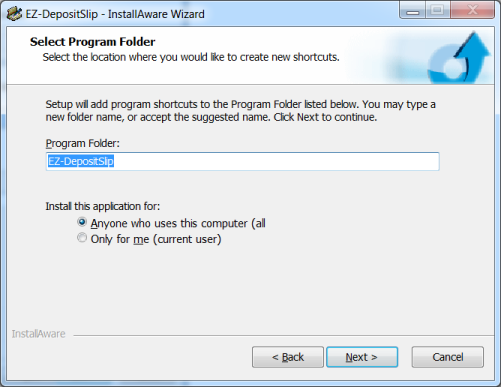 Firefox will display a message asking if would like to save the file ezdepositslip_demo.exe. Select Save File. This will open the download manager. If you dont see the file progress bar or a file name, select the green down arrow in the upper right or press Ctrl-J on your keyboard to display all downloads. 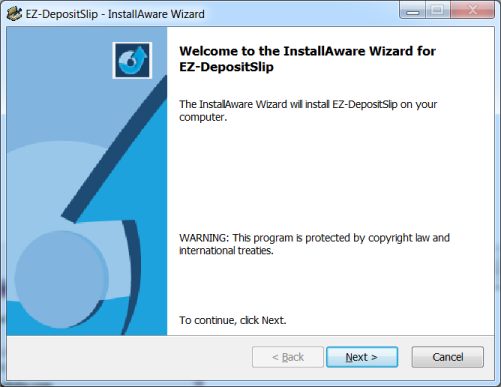 Double click the file ezdepositslip_demo.exe to launch the InstallAware wizard. Go to Step 2 below. Some browsers may display the a security warning. 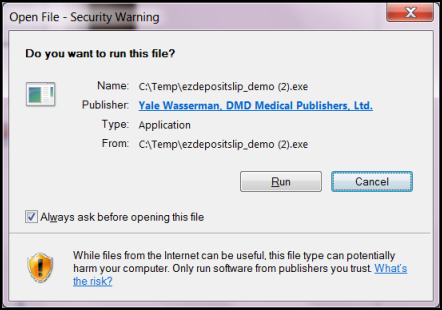 If prompted with the graphic above, select Run to confirm the Publisher Security Certificate. 2. After a brief security scan or the Install Aware Wizard will appear. Select Next to Continue. 5. 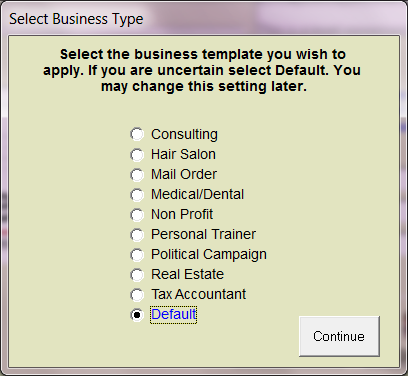 Select Next to Complete the InstallAware Wizard. 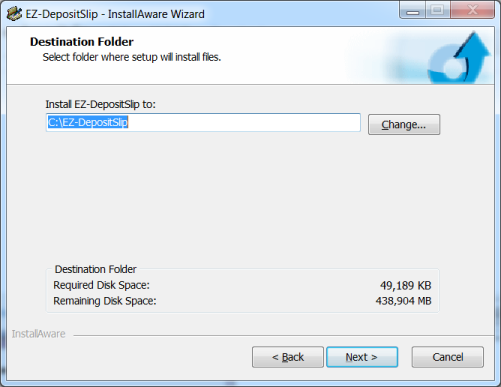 The Wizard will install the necessary files and prompt you to Run EZ-Deposit now. Select Finish with “Run EZ-DepositSlip now” checked. 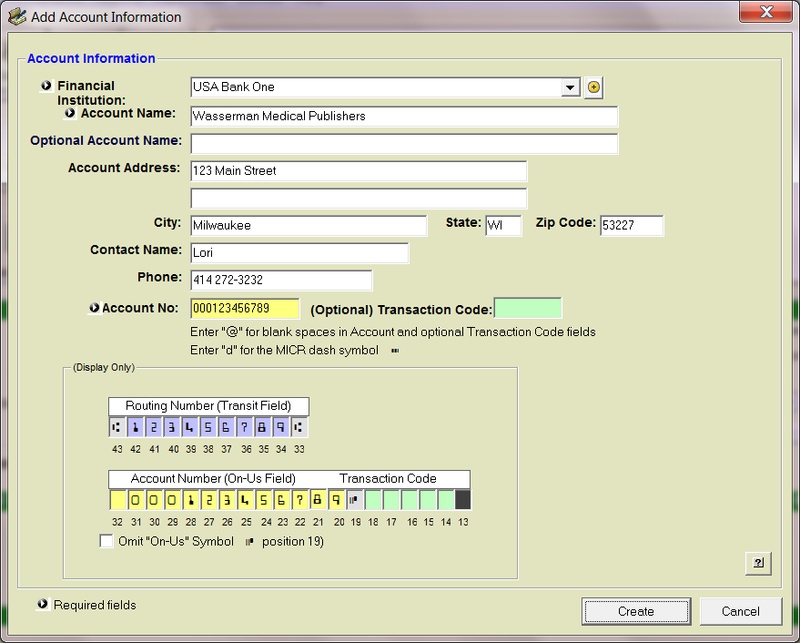 If you are running EZ-DepositSlip for the first time there are a few initial settings and account setup screens that need to be completed. This should take less than two minutes. You will need your bank routing and account numbers. If you don’t have this it’s ok, just use an alias ie (012345). 1. Read the EULA and select Accept to continue. 4. 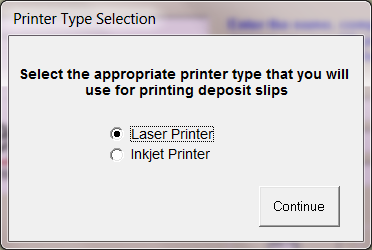 Select Printer Type. This can be changed later. 5. You need financial institution (bank) to create an account, select OK and then select the orange + button. 6. Enter your bank information here. The only two required fields are Name and Routing Number. The bank address is optional and can be edited later. 7. 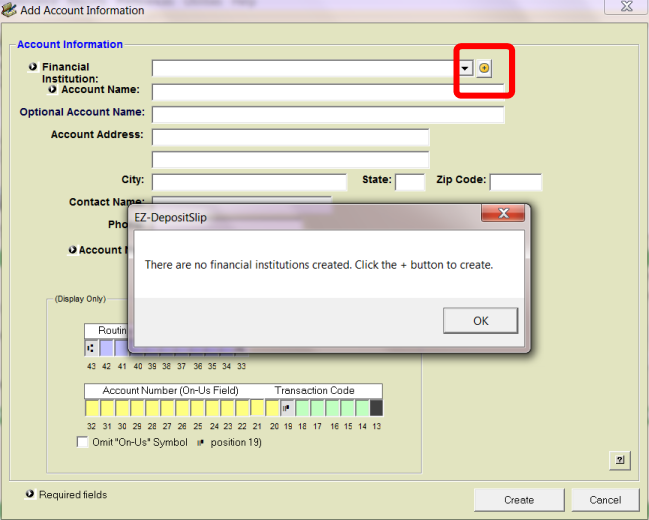 When you select Create on the Add Financial Institution form, you will be taken to the Add Account Information form. Enter your Account Name and Number (required). Other information can be added later. 8. When you select Create on the Add Account form, you will be taken to the Main Screen with the account dropdown list displaying your newly created bank account. Simply double click on the account. Now enter your checks. We designed this software to make your business life easier. 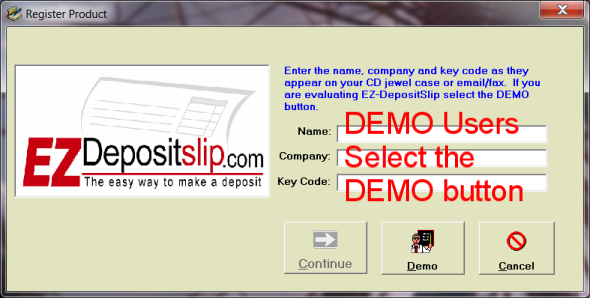 If you need additional help installing or using EZ-DepositSlip contact us.